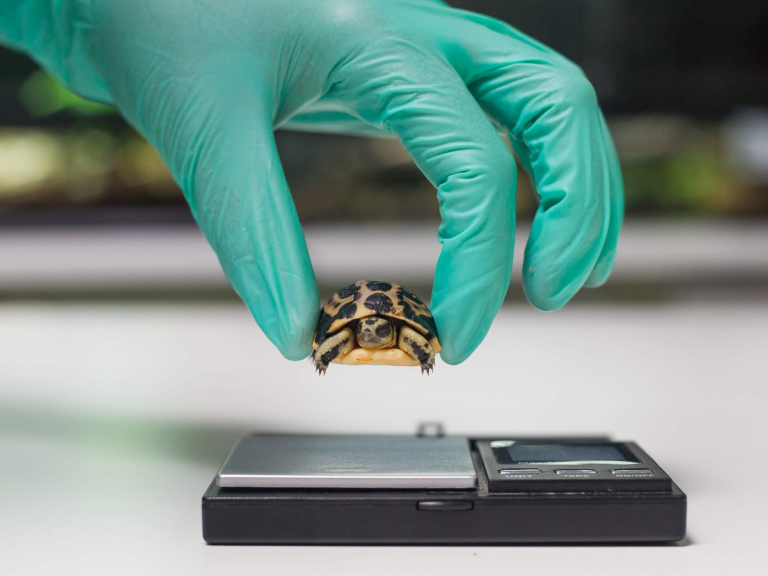 The spider tortoise (Pyxis arachnoides) is one of the world’s smallest tortoises – and one of the rarest. A burrowing species, it’s found around the south western coast of Madagascar. The adults are only around 6 inches long. Their popular name comes from the spider’s web patterns on the shell. Little is known about the life cycle of this tortoise, although it’s thought to live for up to 70 years. One thing that is well understood is the threat of extinction. The IUCN Red List classes the species as Critically Endangered – that’s just one step away from Extinct in the Wild. Paignton Zoo is home to four adults – two males, two females - ranging in age from 11 to 22 years. Experienced keeper Andy Meek had to devise a husbandry protocol based on field data and the experiences of other collections. It was a long, complicated process but, put simply, he had to mimic the natural seasonal changes the adult animals would experience in the wild, with all the corresponding fluctuations in weather and diet. This included spraying the tortoises with water to simulate rainfall. One of the critical elements is a period of brumation – a state of dormancy during a cooler time of the year. Mating tends to occur after this period. One single egg was laid (which is normal for this species) and hatched after roughly 180 days of incubation. An added complication in the process is that the egg needs a cooling period – a delay in development. The egg was incubated by staff in a special custom-made incubator, with progress monitored carefully and daily records kept. The single egg hatched on Wednesday 25th April. It’s the first breeding in a UK zoo of a species that can be notoriously tricky. The team will rear the youngster and then send it on to another zoo in due course. Zoology is a vocation – zoo keepers are characterised by their passionate devotion to the animals with which they work. But then there’s the science, the methodical, clinical, evidence-based analysis which helps achieve results. It’s a fascinating combination. It’s hard to see much hope for the spider tortoise in the wild. Deforestation, mining, road building and livestock grazing are all major threats. Then there are the pressures of invasive plant species and locals who hunt them for food. Finally, collection and smuggling for the international pet trade is a significant threat. “Our success is down to the combination of particular husbandry and precise incubation. We also managed to deal with the complicated incubation process and changing the temperatures throughout. “This species is not doing well in the wild. The more we can breed them and the more we can learn about their captive management and reproductive biology, the more we can contribute towards effective conservation measures in-situ.” Paignton Zoo Environmental Park is a registered charity. For more information go to www.paigntonzoo.org.uk or ring 01803 697500.